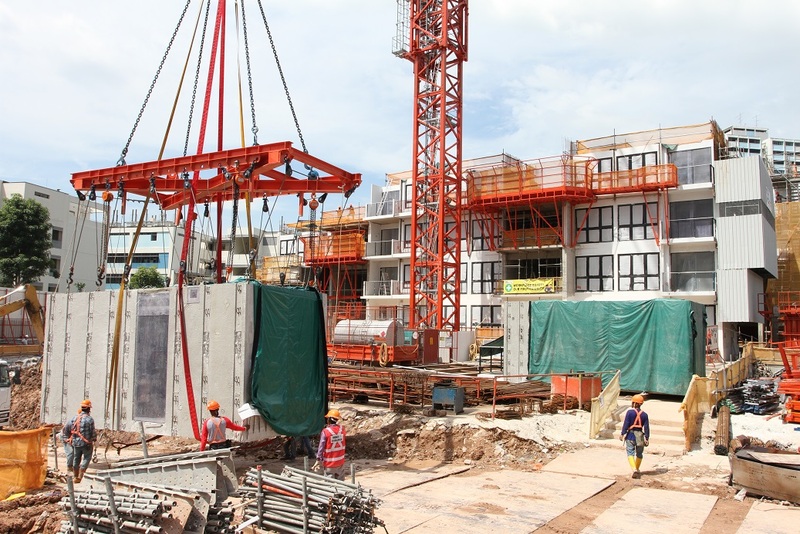 Dragages Singapore is relying on two ‘top of the range’ Liebherr 1000 EC-H 40 Litronic High-Top tower cranes to erect the two 40-storey towers of the island’s first all-concrete PPVC structure. 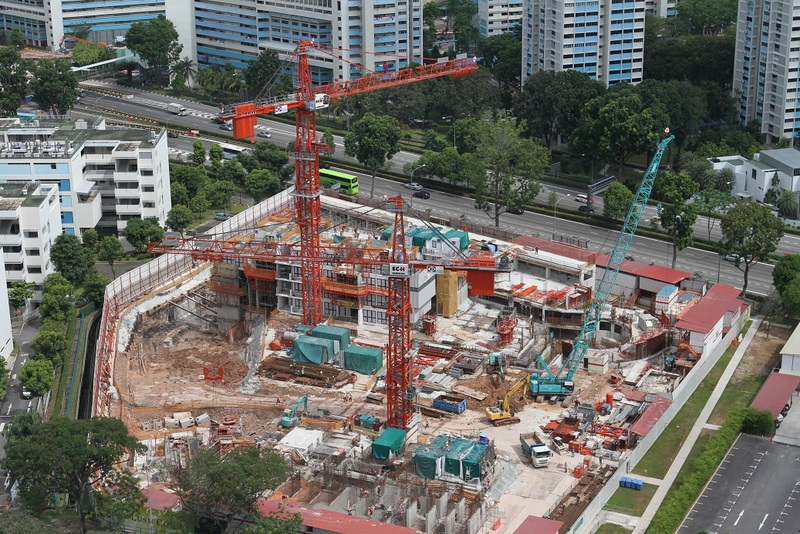 Liebherr’s two units of 1000 EC-H40 tower cranes in The Clement Canopy Project Site located at Clementi Ave 1, Singapore. Main contractor Dragages Singapore is using two Liebherr 1000 EC-H 40 Litronic High-Top tower cranes to erect the two 40-storey towers of The Clement Canopy, a condominium project that is the first structure on the island to be constructed using an all-concrete version of the Prefabricated Pre-finished Volumetric Construction (PPVC) system. Although this form of construction has been used elsewhere in the world, the project is the tallest ever to be built anywhere using concrete PPVC. To date, these cranes are the heaviest-lift tower cranes ever to have been imported into Singapore, having a lifting capacity of 40 tonnes at a working radius of 35m, and are top of the Liebherr 1000 EC-H High-Top range. These units are manufactured in Germany, Liebherr’s Biberach factory, upon order confirmation. PPVC is a method in which free standing volumetric modules complete with finishes for walls, floors and ceilings are prefabricated and then erected on site. Much of the construction work is therefore done off-site in a controlled manufacturing environment, achieving productivity improvement in terms of manpower and time, minimising dust and noise pollution, upgrading skills, and improving on-site safety. Singapore mandated PPVC for selected zones late in 2014, and is closely monitoring the use of this system as this method of construction is to improve productivity in construction sites. 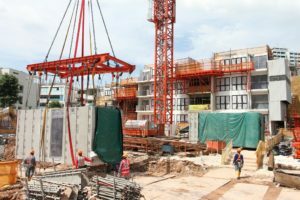 Senior Methods Manager at The Clement Canopy, Kevin Lai, says that Dragages’ first experience with this system was as far back as 2006, with prefabricated bathrooms for “The Sail” condominium, a prestigious residential project at Singapore’s Marina bay area. “The first time we did a complete PPVC project was at the nine-storey Crowne Plaza Hotel extension at Changi Airport, which has just been completed,” he says. A new PPVC module arrives on site. “The modules were prefabricated in Shanghai, but they are steel-framed and are quite light, at less than 20 tonnes. So we were able to use a moderate heavy duty tower crane for that project. “Our second PPVC job was the Woodlands Crescent Nursing Home, also nine storeys, and that is a hybrid of steel and concrete. Each ward consists of three or four modules, weighing between 10 and 20 tonnes each. “The Clement Canopy is the first time that the modules have been completely concrete, and they are very heavy – the heaviest weighs 29 tonnes. Dragages Singapore was appointed in April last year by United Venture Development to build The Clement Canopy project, which is located at Clementi Avenue, a residential and student neighbourhood in the west of Singapore. Comprising two 40-storey tower blocks, the project will have 505 apartments with a total floor area of 46,000 m². Under the Singapore government land-sale requirements, 65 % of the superstructure has to be constructed using reinforced concrete PPVC modules. Designed by ADDP Architects, The Clement Canopy is schedule to complete within a 36-month programme. 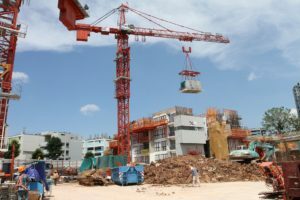 Mr Lai says that during the planning stage Dragages and the architect worked together to optimise the layout, dividing the residential units into modules and ensuring that one tower crane could be used to build each block. In this way it was calculated that the heaviest module would weigh 29 tonnes, with the lightest at 17 tonnes. Dragages then looked into the crane market to see what was suitable. The company is familiar with Liebherr cranes from usage in Singapore and Hong Kong, and by a process of elimination, the choice came down to three brands. Liebherr was selected for a number of reasons including lifting capacity, reliability, Singapore backup service, the technical support of the Tower Crane Solutions department in Germany and an attractive package. Another advantage, says Mr Lai, is the size of the tower crane sections, which are smaller than those of the competing brands. “We shall certainly consider purchasing if we have more work of this kind”, says Mr Lai. 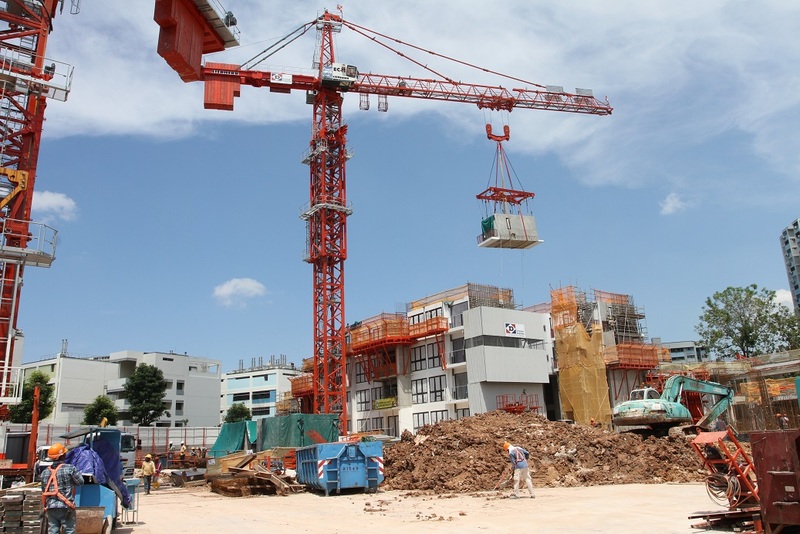 As this was the first occasion that a Liebherr 40-tonne capacity tower crane had been brought into Singapore, there was a lengthy and stringent approval process that had to be completed, taking around six months, before the cranes could be imported. They arrived in December and January, and took between four to five days to erect on site. A 27-tonne module is lifted into position on the structure. Seng Swear Wern, Civil Production Manager on the project, says that PPVC has allowed a reduction of the on-site workforce, but there are increased number of personnel involved in the factory prefabrication. Mr Seng explains that the concrete modules are being manufactured in Malaysia, and then trucked over the causeway into Singapore, where they are taken to the Dragages fitting-out factory at Tuas, on the far western side of the island. Transformed into fully fitted modules, they are then taken by flatbed truck to the site. The largest of the modules measures 8.5 m in length by 3.2 m width and 3.15 m in height, complying with Singapore transportation regulations that stipulate a maximum trailer width of 3.4 m and overall trailer transportation height of 4.5m. The Liebherr tower cranes are equipped with a Micro-move precision placing system, operated from the cab, and in addition Dragages has its own laser guiding system to ensure accuracy. The operators are Dragages personnel, and have been provided with training by Liebherr Singapore. With a jib length of 35 m, both of the cranes are able to operate from a fixed position outside of the two towers, and being tethered to a non-modular element of the building, will grow as the structures grow. There are in total 1,866 modules. Dragages in the early stages of the project is averaging the lifting of five modules per day, and is aiming to increase this to eight as the project progresses. The total lifting operation is programmed to take between 13 and 14 months. Issued on behalf of Liebherr-Werk Biberach GmbH by Joem Promotions.